Easter has come and gone leaving behind a huge container of leftover ham that has found itself in a multitude of dishes throughout the week, and all throughout the week, I’ve been dreaming of these scones! I could hardly wait for Saturday morning to come so that I could finally make them! Fluffy and golden, studded with bits of ham and pockets of melted cheese and slathered with butter; well, let’s just say these scones need to be in your belly, right now! 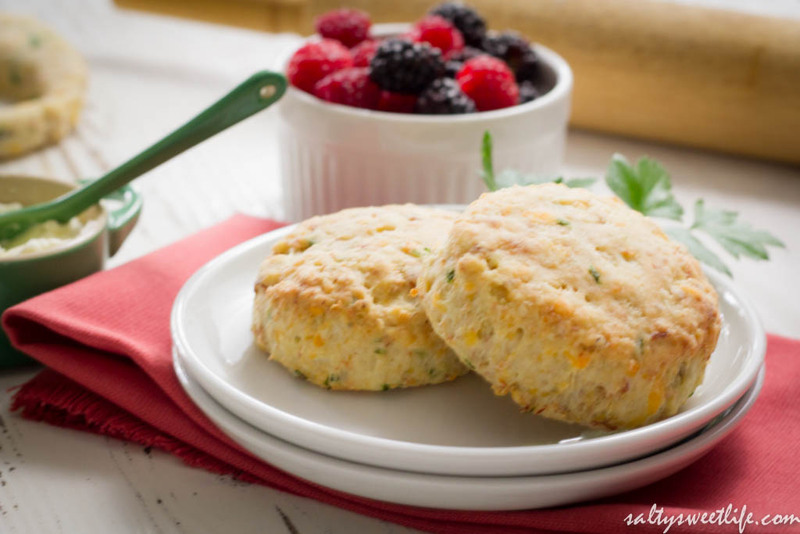 With the help of a food processor, you can mix up these scones in mere minutes, and before you know it, these hot, buttery scones will be on your breakfast plate, ready to be devoured–or as in our case, snatched hot off the baking pan and devoured while standing in the kitchen! 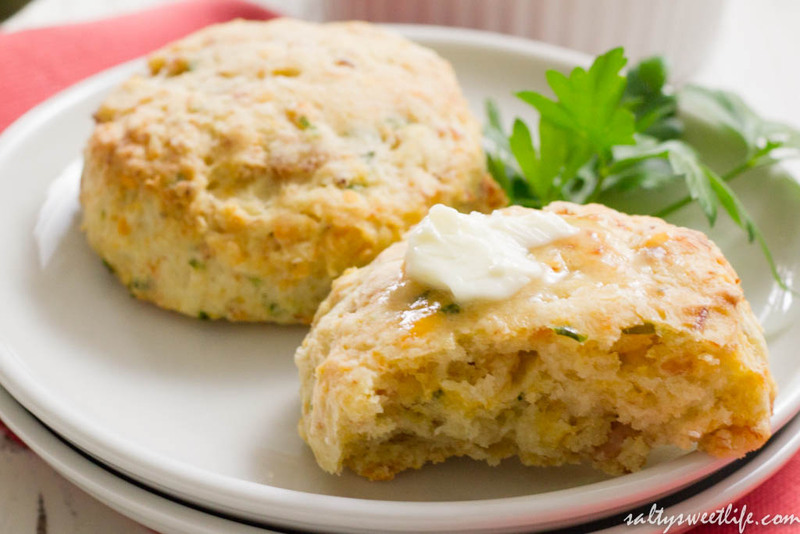 Either way, you’re going to love these savory scones! In the base of a food processor fitted with a dough blade, add the flour, sugar, salt, baking powder and baking soda. Pulse a few times to throughly mix the dry ingredients. Add the cold butter cubes to the flour and pulse until the butter is mixed throughout the flour. Add the cheese and the onions and pulse to combine, then add the ham. Pulse a few more times until the ingredients are well mixed. Slowly add the buttermilk through the feed tube and continue to pulse until a dough forms. Remove the dough from the food processor and shape into a disc. Place the disc in the refrigerator for 30 minutes. Meanwhile, preheat your oven to 375 degrees. After the dough has rested for 3o minutes, place the disc on a lightly floured surface and roll the dough to about 1/2 inch thick. Then cut the dough into rounds using a round cookie cutter. Since I don’t have a proper round cookie cutter (remember, I don’t do much baking!) I used a floured Pilsner glass–works just as well! 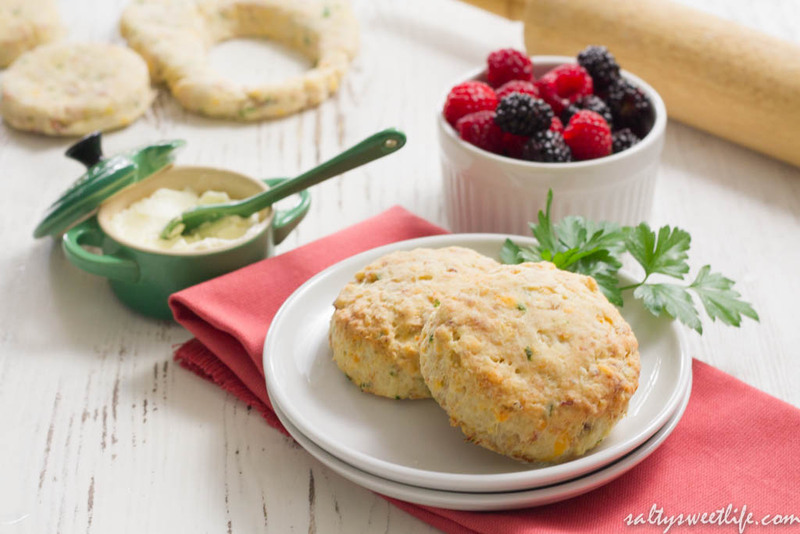 Scoop up the leftover dough to shape into more scones. Place the rounds on a parchment lined baking sheet and bake for 25 minutes total. At the 20 minute mark, I brushed the tops of the scones with melted butter and popped them back in the oven for 5 more minutes until they were golden brown. **Note: I had to add additional buttermilk because the dough was too dry and crumbly to form a ball–this is possibly because I live in a very dry environment. Start with 1/2 cup buttermilk and add additional buttermilk only if you need to. I baked these scone in two batches. The second batch was made using the leftover dough from the first batch. While the first batch baked in the oven, I shaped the leftover dough into a disc and refrigerated it, then rolled it out using the same process as described above. These look awesome Tracey, I wish I had seen this before I threw away all that ham 😦 Your baking skills seem to becoming along just fine! Girl, no you didn’t throw away ham! Thank you Christina! I’ve actually been doing quite a bit of baking lately, I just haven’t been able to blog about it! I still have a lot more ham, plus the hambone in the freezer. I think soup is on the menu soon! Wow this looks so good! And so easy to make! What did you eat them with? Hi Dana! 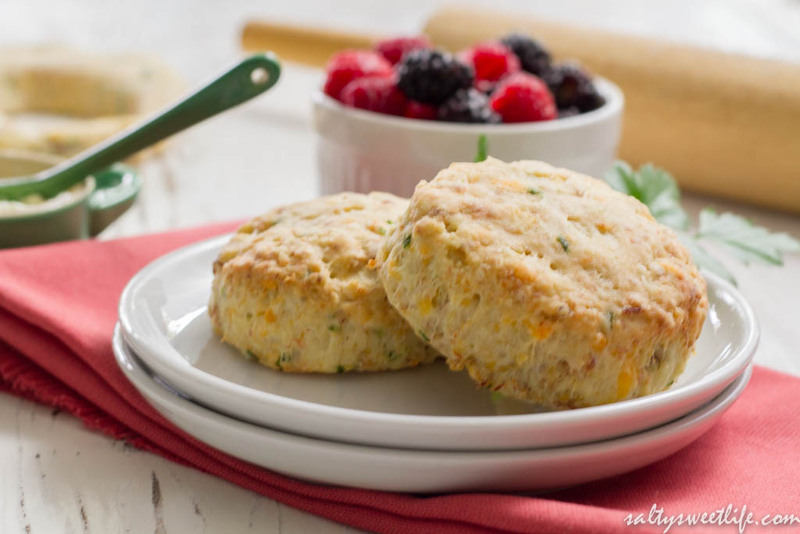 We ate these with scrambled eggs and a side of fresh berries! These scones look absolutely delicious! Another great idea for making breakfast a feast…love it! Thanks for sharing this recipe with us! Thank you so much Jodee! They were so tasty! We just polished off the leftovers this morning! Nothing better than fresh scones! These look fantastic!! Thank you! I’m not a huge fan of sweets, so this savory scone really hit the spot for me! So glad you are starting to bake more! The possibilities are truly endless!! Even with just savoury!